Jose Mourinho is ‘not fully convinced’ by Luke Shaw, according to reports. Having signed for Manchester United in the summer of 2014, Luke Shaw was touted as one of the world’s best emerging left-backs. The quality of the clubs that were after him before United snapped him up is evidence to the undoubted talent he possesses. However, the last two years have been anything but blissful for the youngster. Following his £27 million move to Old Trafford from Southampton, he showed up to his first pre-season training session overweight, which clearly incensed then-manager Louis van Gaal. The youngster was therefore, put on his own special training routine with the fitness coaches, and was forced to change his diet. The rest of his season was marred by inconsistent performances and niggling injuries, but he did show glimpses of his abilities. At the start of last season, van Gaal almost triumphantly declared that it would be ‘the season of Luke Shaw’. It was almost as if the Dutchman jinxed it. Determined to prove his critics wrong, Shaw came into pre-season last summer in impeccable shape. While most players were on holiday, the Englishman trained hard in the summer and his attitude was praised by everyone in and around the club. His start to the season was equally good, and it seemed as if all his hard work was paying dividends. An away tie against PSV Eindhoven in the Champions League saw Shaw take off on one of his trademark runs. Having dribbled past quite a few players to make his way into the penalty area, the 21-year-old was hacked down by Hector Moreno, who was adjudged to have got enough of the ball for penalty appeals to be waved away. But the ball was certainly not all he got, as Shaw felt the full force of Moreno’s follow through, suffering a double fracture that could have ended his career, but thankfully just kept him out for the rest of the season. 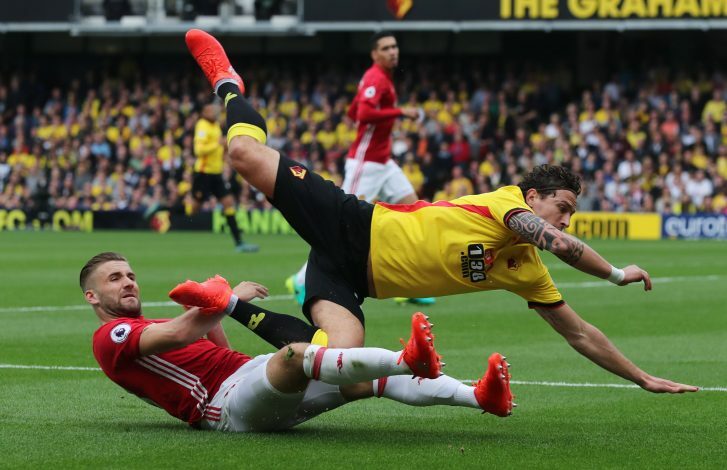 Shaw made an incredibly speedy recovery, and his desperation to get back to full fitness was impressive if not remarkable, given the circumstances. However, yet again, the onus was on the youngster to prove himself. With van Gaal getting the sack and Jose Mourinho – the man who claimed the player was too overpriced while in charge of Chelsea – replacing him, Shaw had more work still to do. Mourinho has been taking it slow with Shaw so far this season, adopting a cautious approach and opting to avoid any possible chance of aggravating the injury. However, even in the games he has played, Shaw has struggled to really prove his worth to the team so far. A disappointing performance against Manchester City in the EFL cup, where Jesus Navas repeatedly got the better of him, showed that there was still quite a bit of work to be done. However, Shaw did follow it up with a decent performance against Burnley. He is yet to fully convince Mourinho of his abilities, though, and speaking after the clash against Manchester City, he said: “It’s normal that you’re frustrated on Sunday because I would have loved to play in that game (against Chelsea), but it obviously wasn’t meant to be. At the end of the day, it is the manager’s decision. “Obviously with the injury with Eric (Bailly) now, it might be my time to step up and show the manager what I can do and that he can trust me. “The first half against City wasn’t the best of mine. I thought I did ok, but I was maybe getting too tight on Jesus Navas for some of the crosses. “But I came out in the second half and I felt much better. I was closing him sharply, we made sure he got no crosses in and I think at the end of the day, I feel really good.